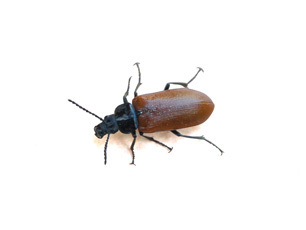 Pirimiphos-methyl is used to control beetles in stored grain and seeds. Pirimiphos-methyl is an insecticide used on stored grain and seeds and in cattle ear tags, to control beetles, flies, mites, moths and weevils. Due to its limited use and low water solubility, it is generally not expected to be a water treatment concern. Although pirimpiphos-methyl is highly toxic to birds and fish, the World Health Organization classifies it as only “slightly hazardous” to humans and mammals. With both short and long term exposure, it has been shown to inhibit the enzyme cholinesterase, leading to symptoms of nausea, dizziness, confusion and, with exposure to very large amounts, respiratory paralysis and death. It is not believed to be carcinogenic. The EPA recommends activated carbon for the treatment of pirimiphos-methyl.